Germany’s first Sharia-compliant bank wants to revolutionize the finance sector of the European economic juggernaut. Investment in businesses related to alcohol and gambling are prohibited, as is the practice of charging interest, and Muslim and non-Muslim customers are welcome. BERLIN — Despite a significant Muslim population, up to now Germany has been unchartered territory for Islamic banking, whose largest European hub is in London. But Muslims from Flensburg to Lake Constance will soon have a banking alternative that embraces their religious values. 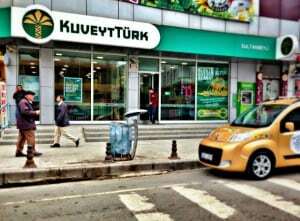 Five years after opening a financial service institute in Mannheim, the Kuveyt Turk (KT) Bank has obtained a full banking license, making it the first Islamic bank in Germany. With headquarters in Frankfurt, and branches opening in Mannheim and Berlin in July, the bank’s core audience are the nearly four million Muslims living in Germany. “But our offer may be of interest to Christians, Jews and others who share our standards,” says general manager Ugurlu Soylu, who has a staff of 70. Its parent bank is Istanbul-based KT Katilim Bankasi, which reported total assets of 31 million euros at the end of 2014. General director Ufuk Uyan speaks of the outstanding international growth of Islamic banking and Germany’s enormous market potential. But how does the business ethos of an Islamic bank differ from a conventional Western one? Investments in businesses relating to arms, alcohol, gambling, tobacco products and prostitution are strictly prohibited. An ethics committee, consisting of members with degrees in Islamic studies and economic sciences, will ensure the bank’s adherence to these responsibilities. But even among other so-called ethical banks serving niche clientele, KT Bank is distinctive. “We have a narrower business area than most conventional banks but a broader business area than most ethical banks active in Germany,” Soylu says. As part of its religiously driven approach to business, KT Bank waives interest rates. The background for this is a Koran verse in which Allah allows trade but prohibits charging interest, proclaiming the practice the work of the devil. But how is a customer supposed to earn a return on savings and how is a bank supposed to earn a profit if charging interest is forbidden? “We have a relaxed relationship with making profit,” Soylu says. But an Islamic bank doesn’t manage virtual investment opportunities, which is how it is different than a conventional bank. “Every single transaction is based on buying real goods, such as a car or a house,” he says. The bank functions as the buyer and sells it to its customer with an added markup. The re-payment is then made in installments. “To our customers, this is exactly the same as paying interest,” Soylu says. In Islamic banking, lending is financed from one single pool in which the savings of all customers is gathered. The customer then receives a share of the yield from all lending business. That’s why, in Turkey, Islamic banks are known as shareholding banks. As opposed to conventional banking, there are no interest rates that are directly linked to a customer’s deposit. This way, a total collapse isn’t possible and risks are spread more evenly, Soylu explains. Stuttgart-based expert Hans-Peter Burghof says that “the community spirit is at the heart of the matter” in Islamic banking.